It may have a hint of niche appeal, but this is an instrument well worth investigating. A vintage, lower end voice. Unique proposition for an OM shape. Control over the TLD-2 preamp would be beneficial, or the choice of a CoolTube instead. Diversity is becoming a key issue in the electro-acoustic market. A competitive price-point isn’t always enough to stand out from the crowd and many players expect their electro to be more than just a stage-ready instrument, but one they can happily use at home and for recording, too. With years of experience behind it, Takamine has established itself as a trusted go-to electro manufacturer. And with the EF740FS-TT here, the company is showcasing an enthusiasm to innovate further with the Thermal Top. Thankfully, it’s not a woolly cover for your guitar but a process that amounts to artificial ageing. The guitar’s top is baked in a very high-heat, vacuum-free low- oxygen environment (the latter so it doesn’t catch fire). The desired effect is that the young wood’s water, sugar and resin are modified in the process. For players, the idea is to add some of the effects of time - an immediate vintage character, if you will. Takamine claims the baking creates a stronger weight-to-strength ratio as the wood becomes lighter and stiffer. The other desired offshoot is aiding stability, making the top a little less susceptible to humidity changes that occur in homes/venues. The original 740FS was introduced in 2010 and found favour with Jackson Browne and El Rayo-X guitarist David Lindley. Part of the appeal for Lindley came from the CoolTube preamp featured on the TF740FS, but the TLD-2 here is a more low-key preamp with no controls. of a steel-string with a classical guitar feel and makes it a distinct playing experience. Visually, the Thermal process’s effect on the spruce creates a darker look more akin to a golden cedar, subtle but beautiful in execution. There’s a consistent flow between the long grain stripes with the sapele sides and back that’s especially striking on the latter. The overall aesthetic is the classy understatement of a classical, but we appreciate the touch of tortoiseshell binding around the sides, too. The OM EF740FS-TT’s dimensions make it an initially difficult guitar to adjust to if you’re coming from dreadnought and parlour worlds. Its fatter neck is more towards a classical feel and, although the string spacing isn’t quite as wide at 56mm, this is a guitar that could feel more immediately welcoming to a nylon-string player looking at steel options. 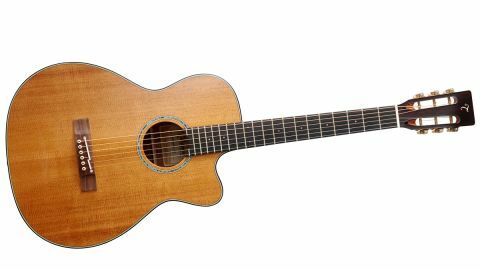 As the FS name suggests, it encourages fingerpicking and the earthy roundness of tone brings a little nylon character with the warmth of a played-in instrument. The boomy low-end is aided by the deeper body and its resonance in the bass is something you can physically feel. The rounded highs are woody rather than ringing, and the medium action responsive to the bends and slides of blues styles. Indeed, that wide neck and shorter neck join has us breaking out the bottleneck. As we change tunings accordingly, the open geared tuners prove their worth with a smooth action. Tuning stability is notable. What part the Thermal Top plays in that is unclear, but it further enhances an impressively solid build. Takamine clearly doesn’t want to interrupt this guitar’s look with the preamp functionality, but in some ways its pursuit of stealth proves a bit of a misfire here. The surprisingly high-output combination of the Palathetic pickup and nine-volt battery- powered TLD-2 preamp represents the guitar well enough, but therein lies a rub. With a guitar so rich in bottom-end, some added control from the instrument would be welcome. As it stands, that would have to come from an additional preamp pedal, amp or communicative soundman. The OM will have a select, dare we say niche, appeal with its crossover connotations. But its tonality suggests Takamine is onto something with its new top technology, and we’re looking forward to seeing the added choices this kind of development presents us players.